Travelled south-east through Perth and over the River Tay then on to St Andrew's. Wayne very excited today to see the home of golf! 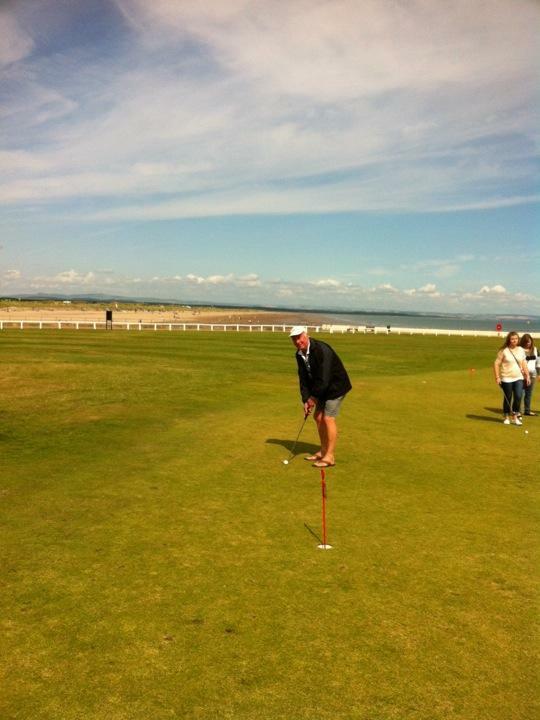 We visited the Old Course and paid 50p to putt 18 holes (we only did a putt each just to take photos and video!) Wayne had to have 4 takes before getting the ball in, I putted it in straight away but nobody videoed me the first time! On to the shops to find our cheap souvenirs and some lunch before checking out the rest of the town. The university is where William met Kate, and the beach is where Chariots of Fire was filmed. We followed the road south along the coast for a while, which was lovely views, and saw lots of golf courses before getting on the motorway to Edinburgh. Didn't get to stay in the city though, ended up at Peebles (an hour south)! Very cranky that we were in the middle of nowhere!